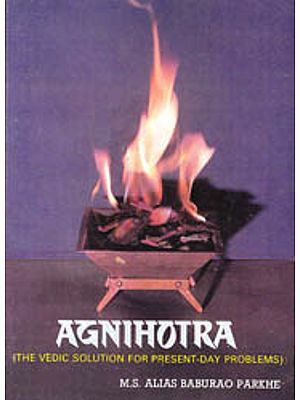 Agni is the most important, the most universal of the Vedic gods. In the physical world he is the general devours and enjoyer. He is also the purifier; when he devours and enjoys then also he purifies. He is the fire that prepares and perfects; he is also the fire that assimilates and the heat of energy that forms. He is the heat of life and creates the sap, the rasa in things, the essence of their substantial being and the essence of their delight. He is equally the will in Prana, the dynamic Life-energy, and in that energy performs the same functions. 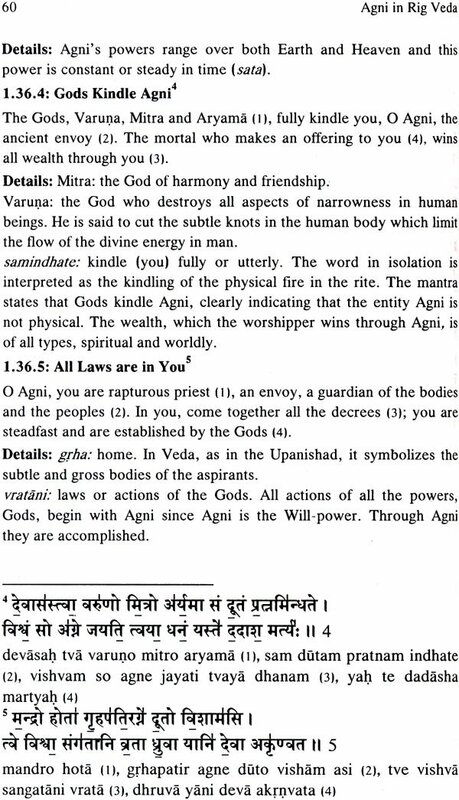 Devouring and enjoying, purifying, preparing, assimilating, forming, he rises upwards always and transfigures his powers into the Maruts, the energies of Mind. 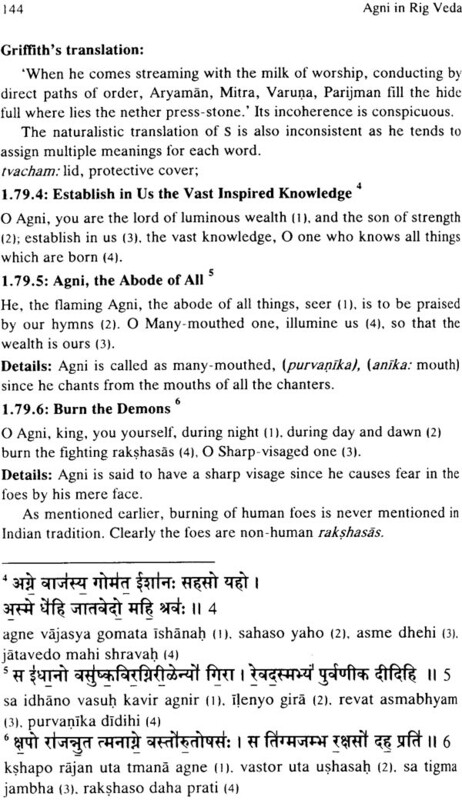 Our passions and obscure emotions are the smoke of Agni’s burning. All our nervous forces are assured of their action only by his support. If he is the will on our nervous being and purifiles it by action, he is also the will in the mind and clarifies it by aspiration. When he enters into the intellect, he is drawing near to his divine birthplace and home. He leads the thoughts towards effective power; he leads the active energies towards light. There was without doubt a good reason for Dr. Kashyap to have planned this publication. While books on Veds are flooding the market, wisdom in most of these books is conspicuous by its absence. The discernable approach in them is mainly intellectual, savoured generously by critical and analytical tendencies. 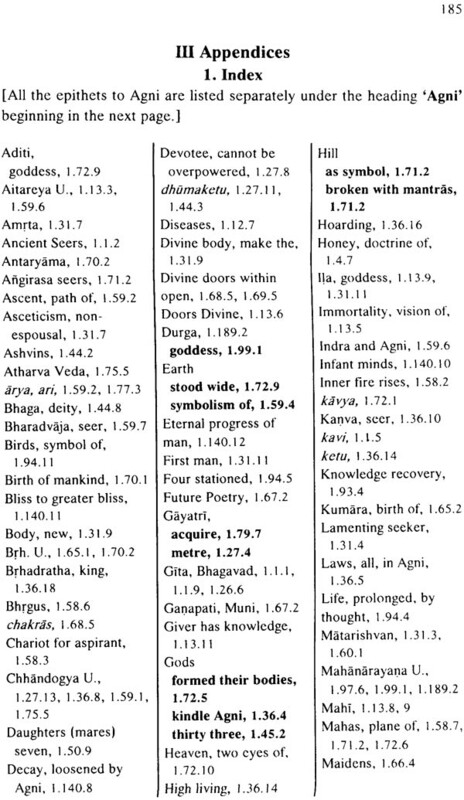 They treat the Vedas as merely literary pieces or as little more than aids to reconstruct a bygone age; the language has been studies, the narration has been pressed for historical or cultural information, and the religious or philosophical overtones have been noted. 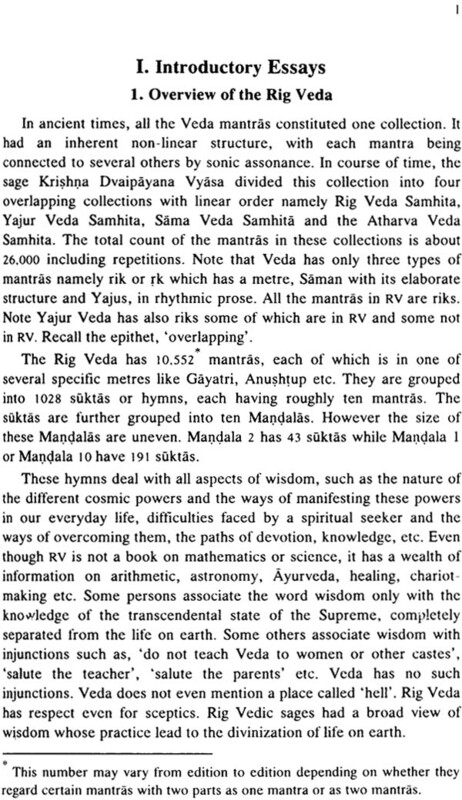 But the most distinguishing feature of the Vedas has largely been missed: the Vedas by their very features of the Vedas has largely been missed: the Vedas by their very intent are coded documents of mystic visions. The one modern authority that emphasized this aspect of Vedic study was Sri Aurobindo; and the one saintly scholar who commented in Sanskrit on the Vedas, inspired by Sri Aurobindo, is T.V. Kapali Sastry Dr. Kashyap has here undertaken to present to the English-Knowing world the approach of Sri Aurobindo and Kapali Sastry, which is not only characteristically Indian in close conformity with the visions of the seers themselves. The present publication has been planned meticulously. It presents in three volumes the first ashtaka of Rig Veda Samhita for which Kapali Sastry prepared his excellent commentary known as ‘Siddhanjana’. 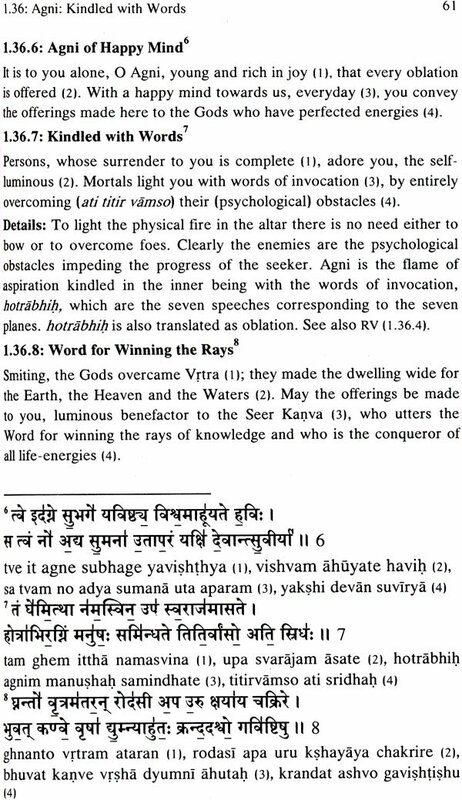 After an elaborate, erudite and insightful introduction, individual mantras have been taken up; the text has been given in the original, the words have been separately translated in English, and a running translation of the entire mantra based on Kapali Sastry’s Sanskrit commentary has been appended. 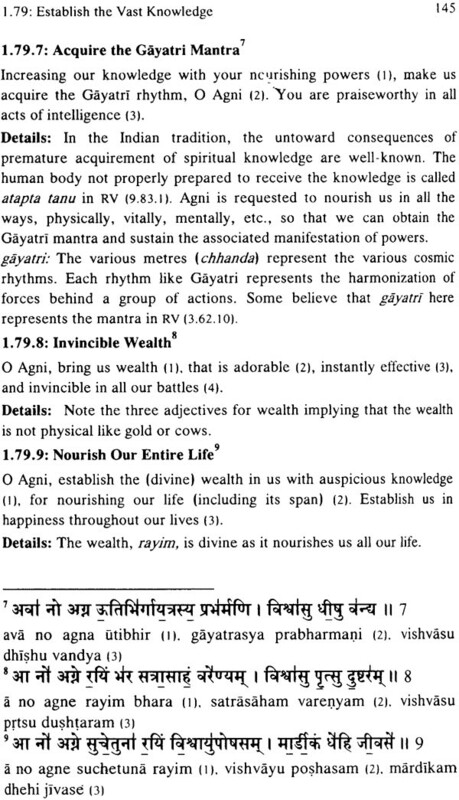 The significance of special words used in the mantra is also indicated. 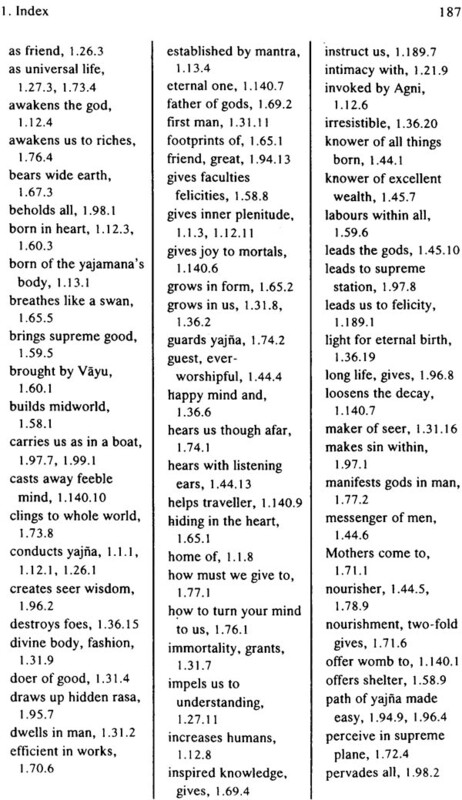 But the most useful guide to the reader here is the title which prefaces the running translation of each mantra. Short, cryptic and appropriate, the title suggests the general import, the hidden meaning and the essential spirit. The book therefore is a valuable contribution towards understanding the Vedic wisdom aright. It may not be improper here to recall briefly the esoteric framework in which Kapali Sastry’s commentary becomes relevant, for this is the principal justification for the present publication. 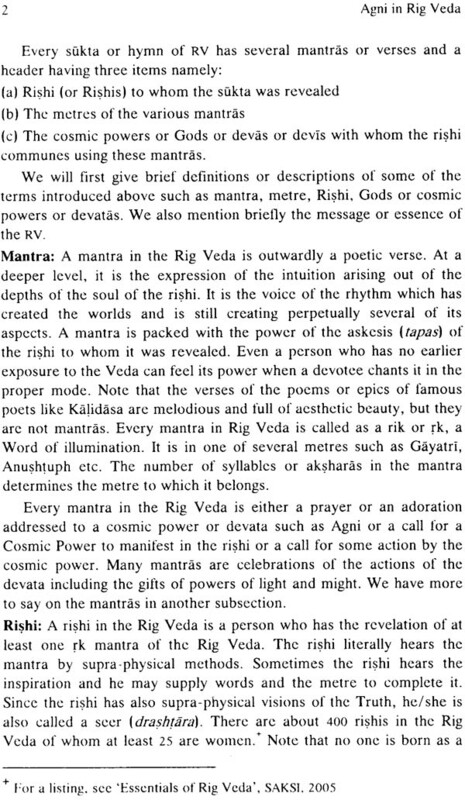 The appended essay entitled, “spiritual interpretation of the Veda: an introduction” is based on the Sanskrit work of T.V. Kapali Sastry entitled ‘bhumika’ to his commentary ‘Siddhanjana’. I have also expressed the key ideas in the form of thirty Sanskrit aphorisms Veda gudartha bodha sutrani using Kapali Sastry’s own words. An English translation of these aphorisms is also included in this essay. It remains for me to express once again mu sincere appreciation for the present publication, planned and prepared by Dr. R.L. Kashyap, and which will greatly benefit the earnest students and the discerning scholars. 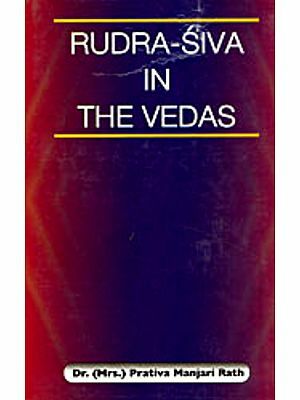 I look forward to the publication of the second and third volumes, completing this project, which aims to reveal the mystic teaching of the Veda as discovered by Sri Aurobindo in the words of Kapali Sastry. I am grateful to the readers for their excellent response to the first edition which has been sold out in a relatively short time. 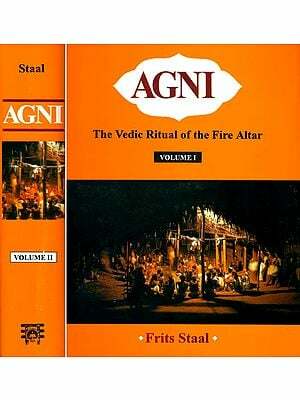 This revised edition has only mantras dedicated to Agni as clarified earlier. 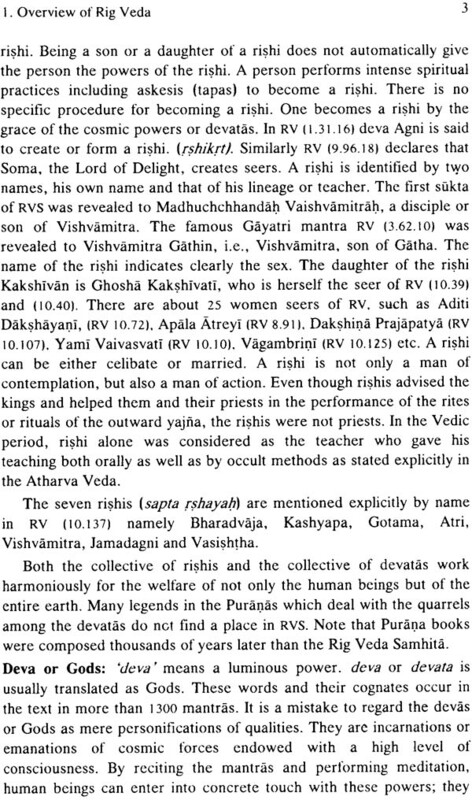 This translation is based on the detailed Sanskrit commentary of Rig Veda Samhita entitled, ‘Saddhanjana’ or ‘mystic collyrium’, by Sri T.V. Kapali Sastry published in 1947. 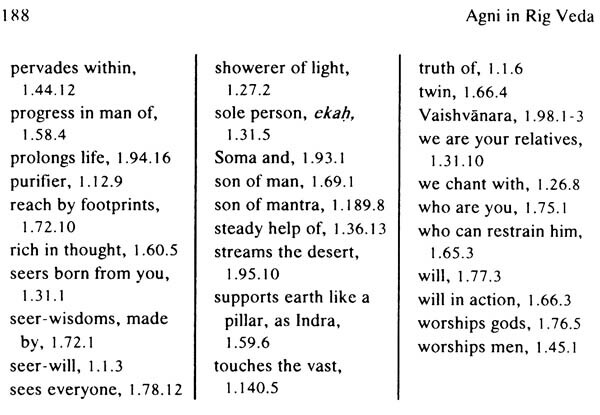 The commentary follows closely the clues to the understanding of Rig Veda provided by Sri Aurobindo who also approved the commentary in toto. Kapali Sastry has been aptly termed a versatile genius with his mastery over the traditional shastras in Sanskrit including grammar, his excellence in composting poetry and the mastery over the modern English works. Even though Sastry has great admiration for the work of Acharya Sayana, he has shown that, even from the purely grammatical point of view, the hymns have a spiritual interpretation different from the naturalistic-ritualistic view of the great Sayana. 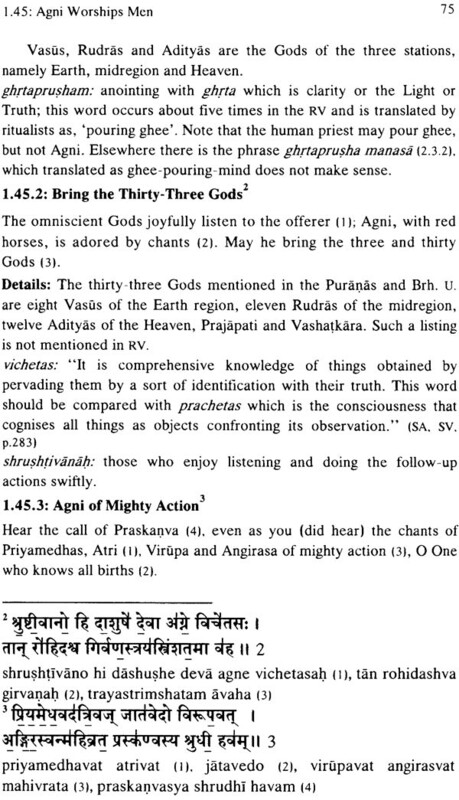 Even though there is a long-standing tradition of the spiritual interpretation of the Veda going back to the Yaska Acharya Ananda Tirtha and Raghavendra Swami, the attitude of the scholars both in the universities and in the Samkrit Pathashalas to this exceedingly original and useful work of Sri Aurobindo has been indifferent to say the least. After all Sri Aurobindo has been indifferent to say the least. After all Sri Aurobindo did not make any extravagant claims for his work. 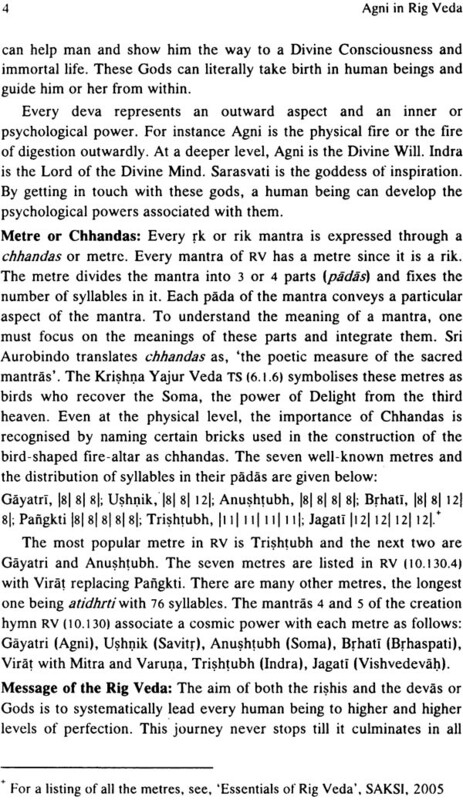 Sri Aurobindo, in his concluding chapter of the ‘The Secret of the Veda’, written in 1917, declared, “our object is only to see whether there is a prima facie case for the idea with which we started that the Vedic hymns are the symbolic gospel of the ancient Indian mystics and their sense spiritual and psychological. Such a prima facie case we have established….. More we cannot at present attempt…. Has been obscured by ages of oblivion and misunderstanding to be adequately dealt within a single work”. Moreover Sri Kapli Sastry has given a detailed response to the criticism of Sri Aurobindo’s approach made by the eminent scholar Dr. Aurobindo’s or Sri Kapali Sastry’s work outside the relatively small circle of their admirers. As a glaring instance of this indifference, consider the 30 volume work on Rig Veda running into 25,000 pages in Kannada prepared in (1946-1959), published in Mysore with the patronage of the Maharaja of Mysore, Sri Jayachamarajendra Wodeyar. 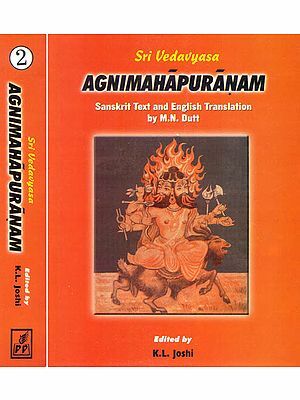 It has a wealth of quotations from the Brahmana books, extensive quotations from the Western Indologists including their low-opinions of Veda, the complete translation of the Sayana commentary, word-to-word meaning etc. 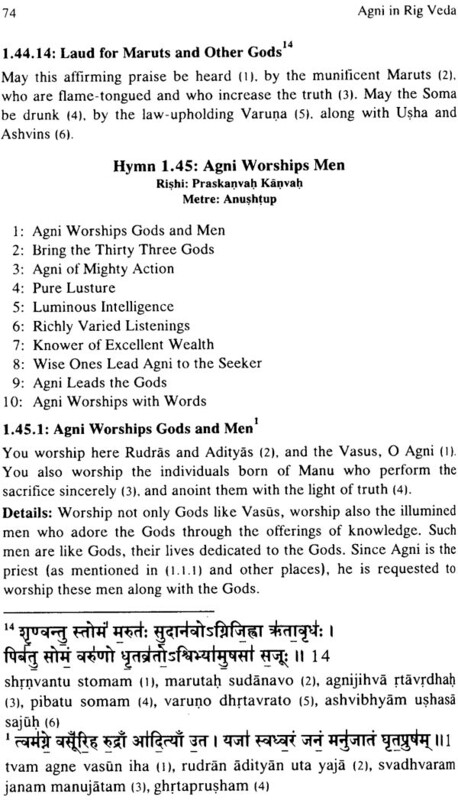 But the work of Sri Kapali Sastry does not merit even a single line here. 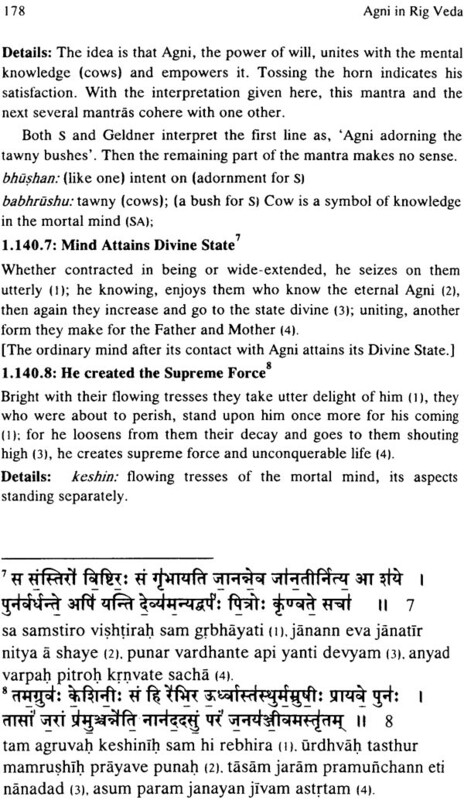 This servile deference to the so-called authorities is well described by Sri Aurobindo: “Europe has formed certain views about the Veda and the Vedanta and succeeded in imposing them on the Indian Intellect… When a hundred world-famous scholars cry out, ‘This is so’, it is hard indeed for the average mind and even minds above the average but inexpert in these special subjects not to acquiesce. The response of the readers to the SAKSI books and the other Veda books published in Bangalore are hearting; the importance of paying attention to the text of the Veda mantras is being realized by many persons. 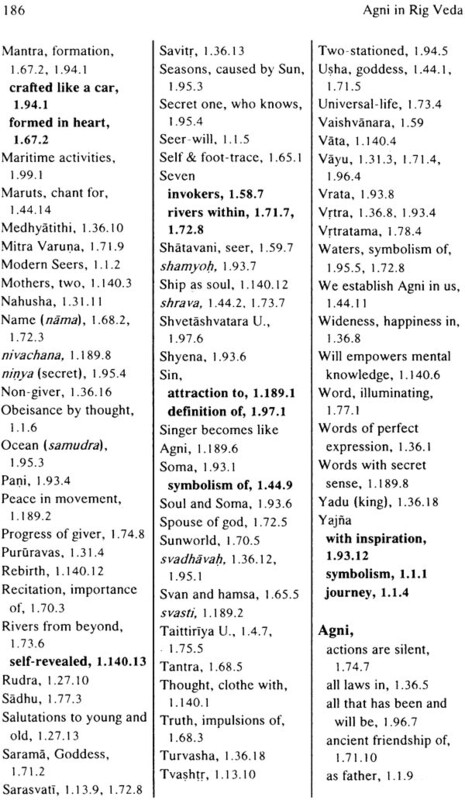 A person with shraddha in the Veda who studies these mantras will have an experience of the wisdom and the power in them, whatever may be the opinions of scholars or commentators.